They come, stay awhile . . . Birds come in all shapes, sizes, and colors. They like to chat with one another as they fly high and low in the sky. Birds make music, with songs that are like the loving words of a friend, and we are lucky enough to enjoy those sweet melodies. But best of all, birds are capable of flying wherever they please — they just let their hearts guide them. And we can do that, too, if we use our imaginations. In a lyrical ode to our winged friends, the creator of Trees turns her eye to a diverse class of creatures that has much to teach about transcending the barriers that lie between us. Brilliant graphic illustrations and a gentle, thought-provoking text pay homage to birds and their wonder-inspiring ways. 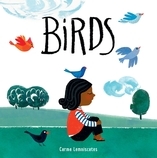 40 / 9 1/16" x 9 1/16"
Carme Lemniscates is an author-illustrator who creates children’s books and storybook apps. Based in Barcelona, she is particularly interested in books that encourage creative thinking and curiosity about subjects such as nature, the environment, friendship, adoption, fear, and self-acceptance.